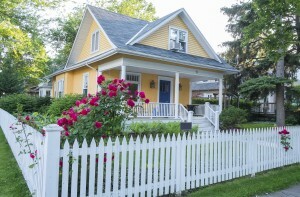 The right fence for your home will depend on several factors. New fences are a substantial investment, so when it comes time to have a new fence installed you’ll need to think carefully. You want to make the right choice the first time! If you have a particular reason to have fencing installed in your yard, whether for privacy purposes or others, it’s important to have that reasoning in mind during the process. Or, perhaps, your old fence is looking a little worse for the wear, but you need something different to replace it. Here are 4 tips to help you get started when deciding on the right fence for your yard. The utility of your new fence will influence a lot of the other factors in the choice. Are you installing the fence to protect and keep your children or pets in the yard? Are you simply looking for a little privacy? Knowing what the fence is being used for in your yard will help you eliminate certain materials or designs from your consideration and narrow down the choice. All types of fences will need varying degrees of maintenance, so ask yourself how much time, effort, and money you can realistically give to this. Wood fencing, for example, requires a lot of maintenance since it needs painted and stained every couple of years. Vinyl and metal fencing is much simpler to keep up with, though they are more difficult to repair than wood is. And wood fencing can often blend in quite well with existing landscaping to increase your property value. Deciding whether or not you can keep up with the maintenance is another crucial step. If a homeowner’s association governs your neighborhood, your choice in fencing may be limited. Ensure that your fence plans comply with any regulations set forth by the HOA. Fencing your yard on your own is possible, but requires specialized tools and hard labor. The right contractor can do all of this for you in addition to securing all of the permits necessary for the construction, so you can rest easy, knowing the right fence for your needs is on its way! Hercules Fence Northern Virginia has countless fencing options for your business and commercial property. Whether you’re excited about a beautiful vinyl chain link fence or already planning out your custom wood commercial fence, we are ready to help you frame and secure your property. Hercules Fence Northern Virginia has been providing homeowners with quality fences for over 50 years. We are well equipped to meet your needs, whether they are residential or commercial. Contact us to see how a beautiful wood fence can protect your property by giving us a call at 703-551-2609 or visiting us online. To see examples of our work, follow us on Facebook, Twitter, Google+, LinkedIn, Pinterest, and Flickr. This entry was posted on Friday, February 10th, 2017 at 6:30 pm. Both comments and pings are currently closed.